At Bernell Hydraulics, we have the skills, knowledge and experience needed to be your premiere source for hydraulic power units in Norwalk CA. We are committed to satisfying every customer in a timely fashion, and we’ll help you get your hydraulic equipment running and make sure it stays that way. If our in-stock power units don’t meet your needs, we can place a special order for you or even create a custom unit. We invite you to stop by one of our locations to learn more about how we can help you with your power unit. If your hydraulic power unit isn’t performing like it should, you can turn to us for help. We’ll send a skilled technician right to your job site to diagnose the problem and provide any necessary repairs. We also offer a special onsite hose repair service as well as maintenance services like fluid flushes and diagnostic tests for your hydraulic power units. You can trust our expert repair technicians to handle any kind of power unit related repair or maintenance with skill and professionalism. 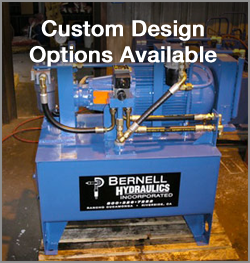 At Bernell Hydraulics, we have a long history of connecting hydraulic equipment owners with the very best in parts and service. You can rely on us to provide high-quality hydraulic power units in Norwalk CA whether you come visit one of our stores, place an order by phone, or use our online store to purchase your power units.